I can’t get her out of mind! The Fierce Phenom who is Täo Porchon-Lynch was featured on NBC Nightly News and her story was a huge shot to my psyche. Part of my personal mission is to live FREE from whatever doesn’t serve my purpose on this planet and to help as many women as possible do the same. And live FREE in Love, Grace,Joy, Contribution, and New Possibilities. Täo Porchon-Lynch is in her 98th year. 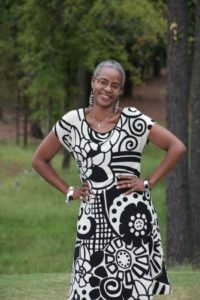 She became enthralled with yoga at eight years old and is STILL TEACHING several classes a week AND does ballroom dancing! ABC News tagged her as the ‘real-life Forrest Gump’ because she’s been present at so many historical events, including marching with Mahatma Gandhi and participating in demonstrations with General Charles de Gaulle and Rev. Martin Luther King, Jr.
See the link below* for the full clip on her incredibly impressive life. What I love most about her amazing story, though, is that she doesn’t drink water…only wine and tea!! I’m still in a paradigm busting mood and what’s more paradigm-busting than living almost 100 years drinking wine instead of water?? And you’re a Kick-A Yogi too??!! Oh! Did I mention she only wears high heels?? Click! Click! What a powerful example of discerning what works for YOU and Living It!! She’s in my LTSG** BARE DIVA Hall of Fame. Ms. Täo is clearly her own muse. What’s YOUR ‘wine and heels’? Your against-the-grain-but-works-for-me habit or life move? It doesn’t have to be as dramatic as Ms. Täo’s, but is there something you do (or want to do) that ‘They Say’ isn’t appropriate because of your age, your gender, your religion, your whatEVER, but YOU KNOW is part of the oxygen that sustains you? Traveling alone is on that list for me. I love rollin’ with my hubby, girlfriends, or clients. Women’s retreats are a fundamental part of my business plan. And I also love the accountable-to-no-one’s-agenda freedom of a solo excursion. I’ve been so caught up in building my business that I haven’t done it lately or at the level I’d like. Correcting that and planning that European solo-cation and some in-the-meantime jaunts NOW. Thank you for the reminder and the inspiration, Ms. Täo! If you have your ‘thing’, I’d love to hear what it is. Life is too arbitrary not to drink your ‘wine’ or kick up your ‘heels’ while you can! **LTSG is the acronym for Let That S%#T Go!, my coming soon coaching program. If you know what you want(and I can help with that, if you don’t), do you have it? If you don’t have it, why don’t you have it? ALL the junk that keeps us living small! And note that I don’t mean that we have to live large as in being out there in front of a lot of people. I mean we are minimizing or hiding our gifts OR refusing to claim and own our beauty and power. ~ ‘Don’t see a chiropractor. They’re not real doctors.’ I’ve been dealing with daily body pain for a few years, most acutely in my knees. There was a segment on a local talk show about the success of cold laser treatment for knee pain that sounded wonderful EXCEPT the provider is a chiropractor. When I checked my bias, I realized that it was 1. based on 30 yr. old info(a lot of which came from traditional doctors who had a vested interest in blocking them) and 2. The potential benefits were too good to not try it. I started this week and will let you know how it goes. That’s just a few of the mental shifts I’m making that are translating to big life shifts. This girl’s gotta move and groove and physical flexibility promotes creativity. cReneCoach is about to Rock and Roll into a whole new level! What’s ONE SHIFT you’d like to make? Why are you stopping yourself from having it?? Let That S%#T GO!!! Unless it’s a Thelma & Louise ride, you can always course correct. Try it. You just might love it! I’m a big Wizard of Oz fan because of its message that we don’t have to search for or depend on the false ‘magic’ of the external. We can tap into our own inner power and fly! Click! Click! A little over a year ago, I decided to seriously walk the path of entrepreneurship. I knew success would require personal change and my big and persistent Knock Knock has been to change my sleeping habits. 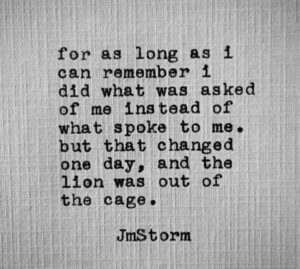 Inner wisdom has consistently whispered this and this lifelong night owl has consistently resisted. I’m wired to be a night owl. My best thinking happens after 10pm. It’s fun t.v. bingeing with my hubby. Isn’t retirement supposed to be about doing what I want to do when I want to do it?? Well, Yes. It. Is. And it was the genius of BARE that helped me FINALLY click into what freedom really means. BARE is the weight loss method I’m certified to coach and the reason I love it is because it teaches how to LIVE yourself to health NOT die(to)it! By doing what feels like self-love, you transition to behaviors that support optimal health. And joyful living! My BIG AHA is that I was confusing ‘doing what I love’ with ‘doing what truly feels like self-love’! Yes, I love staying up all night reading or vegging out on the sofa in a Netflix coma and I CAN do those things, but does doing those things on the regular feel like self-love?? Ummm…No. Do they build me up? NADA! 5:30am – 8:30am… Werk Werk Werk Werk Werk! 9:00am – 11:00… Move My Body Classes! 10:30pm… The #1 self-care habit that supports this life: Taking my behind to bed! My days flow better and I get more done. Doing what I love in the moment must support doing what loves me for a lifetime. And that’s NOT about deprivation. It’s about knowing the difference between self-sabotage and self-love. It’s about grand, BIG picture living instead of the short term high of the less than optimal decision. I’ve seen former addicts talk about how much they enjoyed their drug of choice…how much fun they had…even how much creativity they experienced. Until it wasn’t. Until they didn’t. Our poor habits may not have the extreme negative impact of drug addiction. I could argue though, that continuing to do what keeps us from living the life we want when it’s completely within our power to do differently can be an extremely negative choice. The BARE 80/20 practice is eating power/pleasure foods 80% of the time and strictly pleasure foods 20% of the time. It works across your life. Every now and again, I’ll enjoy a late night or a chicken and waffles lunch(have mercy!) and I’ll enjoy them even more now that the decision comes from a place of TRUE CHOICE instead of that ‘I can’t help myself.’ narrative. Don’t ignore that persistent knock knock. Listen. Do. You’ve got the power, my dears. Own it!! P.S. The pic is the late great, Annie Lee’s Blue Monday and was my ‘look’ every morning during the last few years of my previous life. So, why am I recreating it when I don’t have to?? Done! And if this ‘look’ resonates with you, we need to talk! Three years ago, I launched cReneCoach services and then I piddled. I was kinda/sorta life coaching…helping women do THEIR thing, but not valuing MY thing. Last year, I got serious and as discussed in other posts, I invested a lot of time in crafting the business foundation and focus that works best for me. But It. Ain’t. Over. The ‘saw’ must continue to be sharpened (I’m doing 7 Habits training for a company and it’s been a great reminder!). This year’s focus is… now that I’ve got my WHAT down, HOW am I going to do it? I hired a virtual assistant who’s saved me hours of time trying to figure out the techy stuff. I partnered with a friend AND hired a writing coach to complete the content for an awesome online product coming in June for those who would love a self-study option for getting out of work hell. I’m scheduled to meet with a bookkeeper to get that part of my business straight. And, I still work with my coach because complacency and staleness are not options! P.S. As a life coach, I help the worried well get to doing what only their mind has been holding them back from doing. Stop Worrying. Get about Your Life! 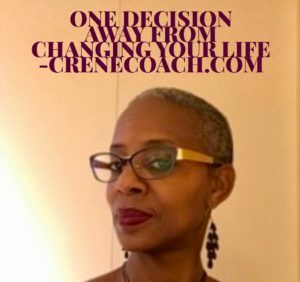 Go to cReneCoach.com and schedule the change you’ve been craving.